Bengali's favorite and biggest festival, Durga Puja is over now. It's like vacation for bengalis. 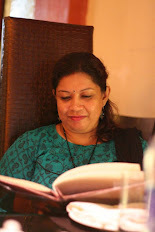 After 7 days of festivity, pandal hopping and eating out, my mind is refreshed and it's time to pay some attention to my blogbaby whom I totally ignored last few days. Again Diwali or Deepavali is coming soon, but before we get into festivity again, I want to post a quick and easy-to-make rice dish I make often but didn't get to post yet on the blog. 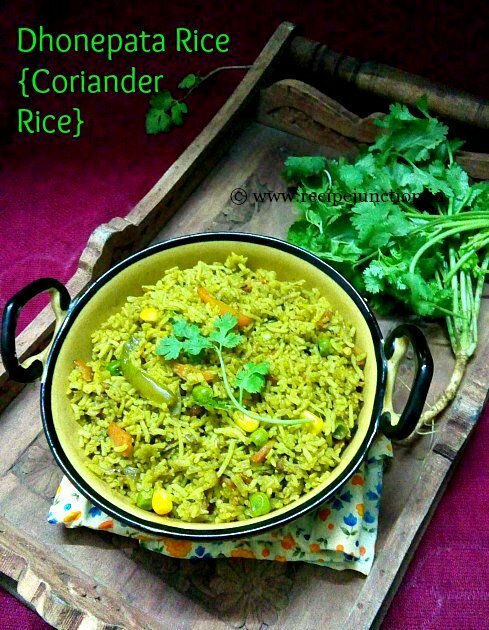 Yes, it is Coriander Rice, which is nothing but a vegetable rice dish made with freshly made coriander leaves paste along with some assorted spices. This is such flavourful dish you don't need anything to go with it. Just a simple salad/kachumber and a bowl of raita(spiced yoghurt) and you have a hearty meal. You can make this in a jiffy and satisfy your hunger when you are short of time to make any elaborate meal. 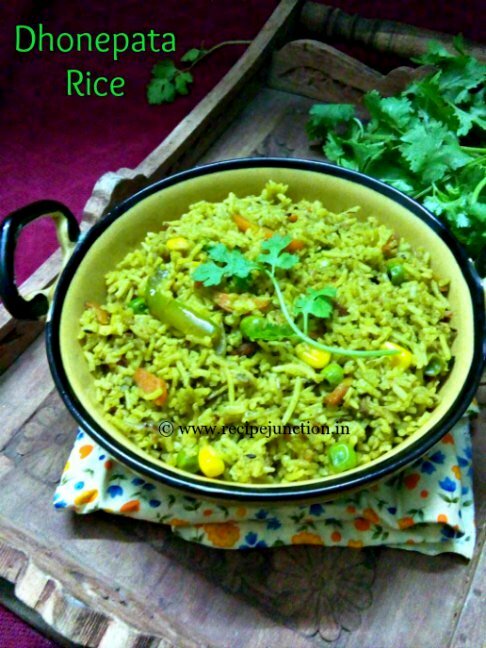 This rice dish is good for packed meal like in lunchboxes for kids as well as adults. Add some mix-vegetable to make this dish more nutritious and delicious. 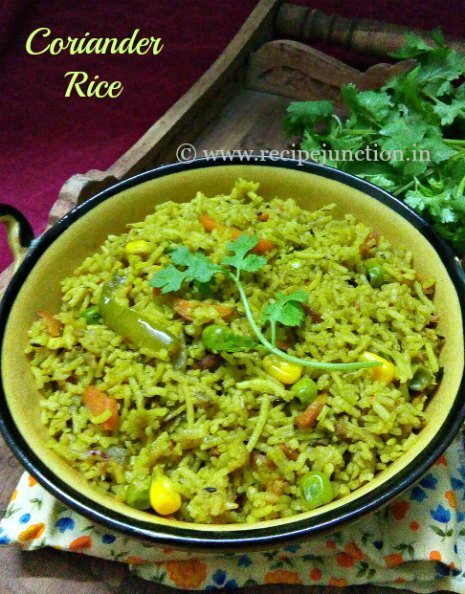 Best thing is you can make this rice dish with leftover cooked white rice also, if that is not so overcooked or mushy. Turmeric Powder : 1/2 tsp. Oil : 1 1/2 tblsp. Clean and soak the rice in little water for at least 30 mins. to 1 hour. In a wet grinder, take all the ingredients listed under "for coriander Paste". Add 1-2 tsp. water and make a smooth paste and keep aside. Heat oil in a pan, temper with bay leaf, cinnamon, cloves, cardamom and cumin seeds. Immediately, add sliced onions and diced up vegetables. Saute for few minutes adding a pinch of salt and turmeric powder. Then add the prepared coriander paste. Mix well. Now add soaked rice in there and mix well with the coriander paste. Season with salt. Now add about 2-3 cups water or as required according to your quantity of rice. Add some extra chopped coriander leaves in the pan and cover with a lid and in medium flame let it cook. Stir time to time so that it doesn't stick to the bottom of the pan. Check the seasoning, add if required. Cook in low flame till all the water evaporates. Fluff up the rice time to time. When rice and vegetables are cooked through but still in shape (i.e., not overcooked), remove from heat and serve hot from the pan. Serve it with Raita or spiced yoghurt and a Kachumber and enjoy a flavourful, nutritious hearty meal made in no time. Kachumber is an Indian salad usually made with cucumber, tomatoes, and onions or all sorts of tiny vegetables, flavored with salt, pepper and lemon juice. It goes with any Indian dish like, Pulao, dal(lentil preperation), veg. or non-veg. preperations. The varieties can be endless.